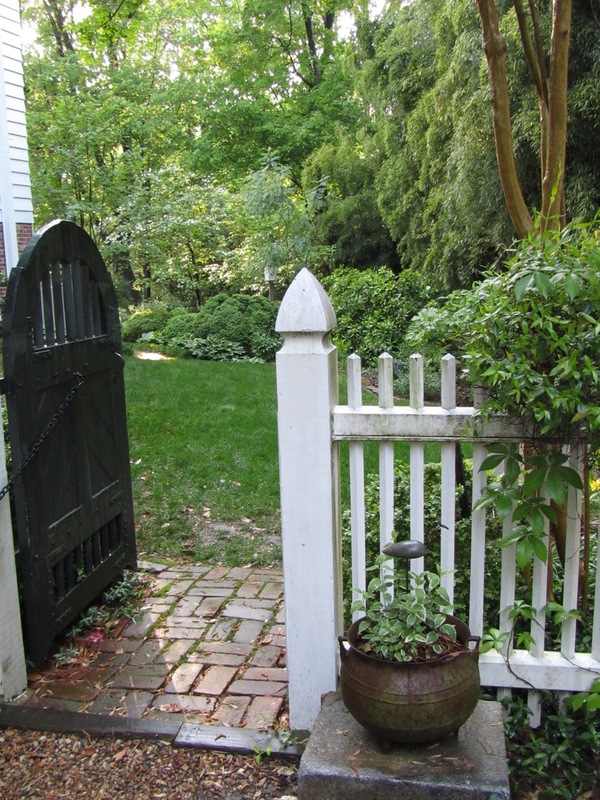 From the street in this west side Richmond neighborhood, you would never know that behind the dense growth of winter jasmine, tall bayberries, plump boxwood and red-tip photinia is a garden gate that opens to a compact, well-designed landscape. Soothing greens with varied textures and shapes entice you to enter through the gate and explore. I always enjoy an invitation to this charming garden. There’s something magic and restorative about the cool spaces in the dappled light of tall trees. The couple who lives on this lovely property designed the garden layout themselves and every bed was developed and planted by them. 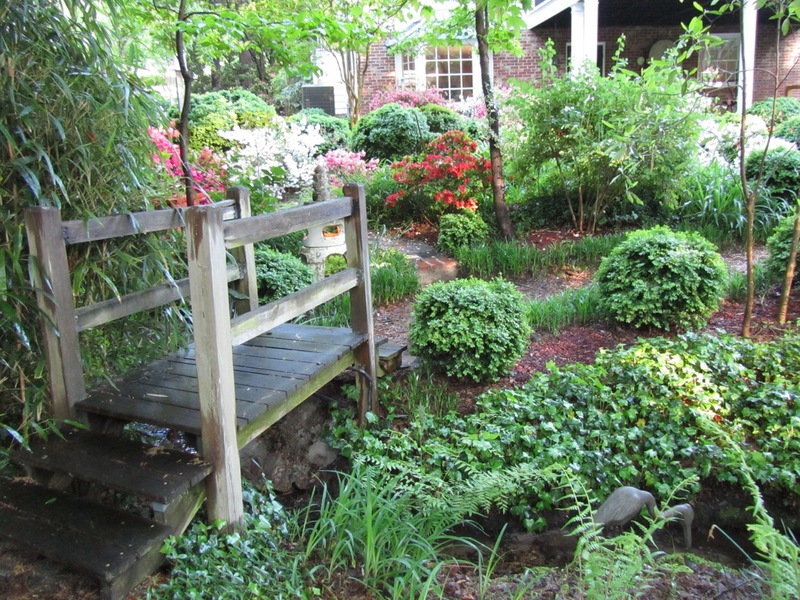 The space has been embellished through the years to become a lush tapestry of foliage punctuated by colorful treasures of flowering trees and perennials. 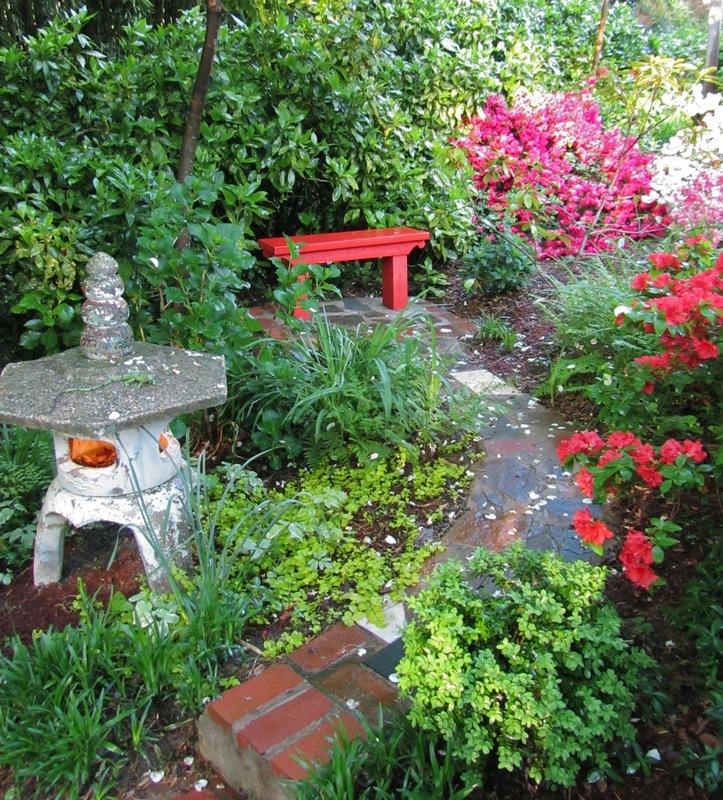 It’s obvious that this garden is their retreat, a place to enjoy the outdoors and fulfill their passion for gardening. It’s great fun to stroll through the grounds with them for he showers her with credit for aspects of the garden and she returns the praise. The rear of the home opens onto a terrace that flows into a small grassy lawn. 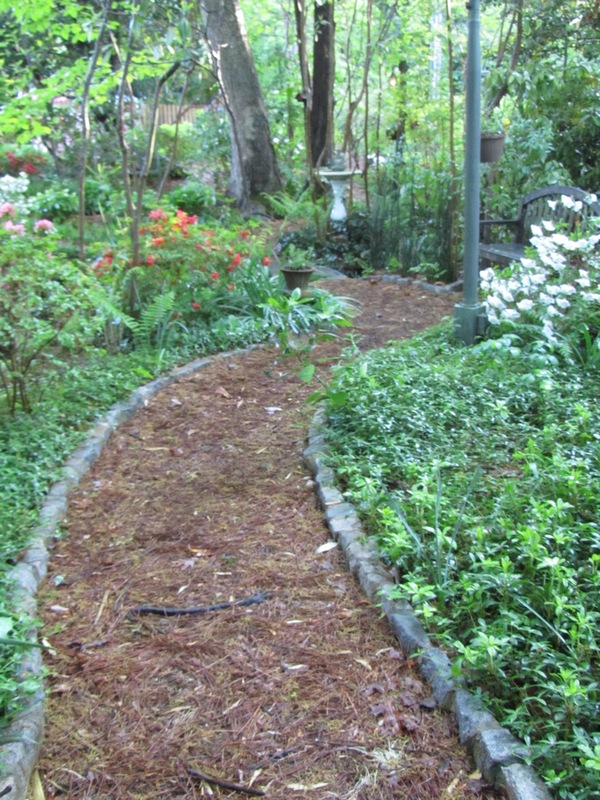 Steps away are several garden paths that beckon. Birdbaths, benches, sculpture, bridges and lighted pagodas are focal points along the woodland journey. A clear stream winds through the shade providing interest and a home for many small visitors. 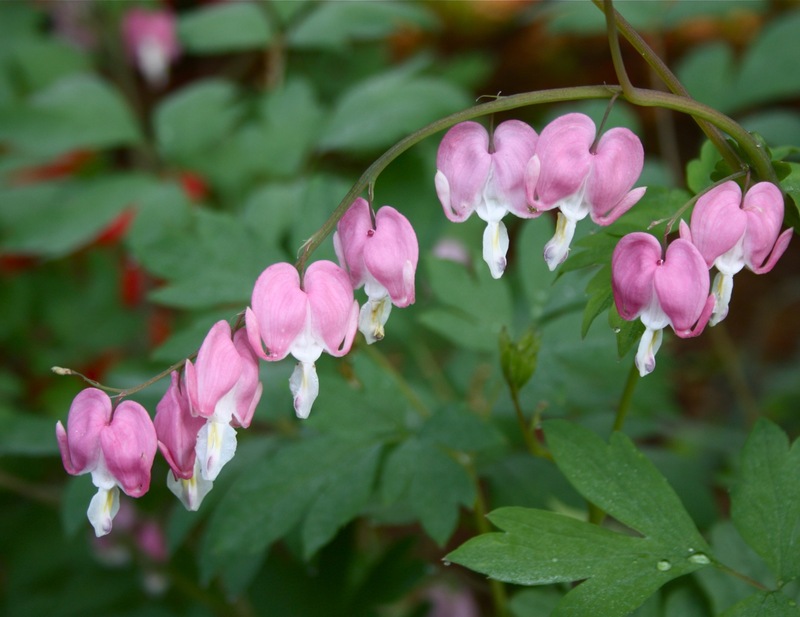 Native plants and new cultivar discoveries pepper the landscape. 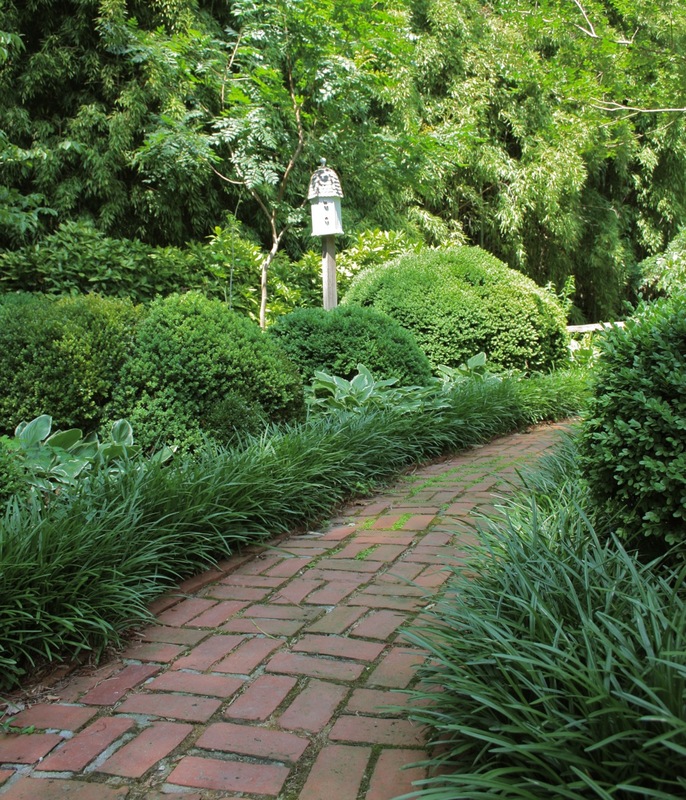 Following the brick walk along a natural rise, a border of boxwood, variegated hostas and liriope edging become the nucleus of this garden. 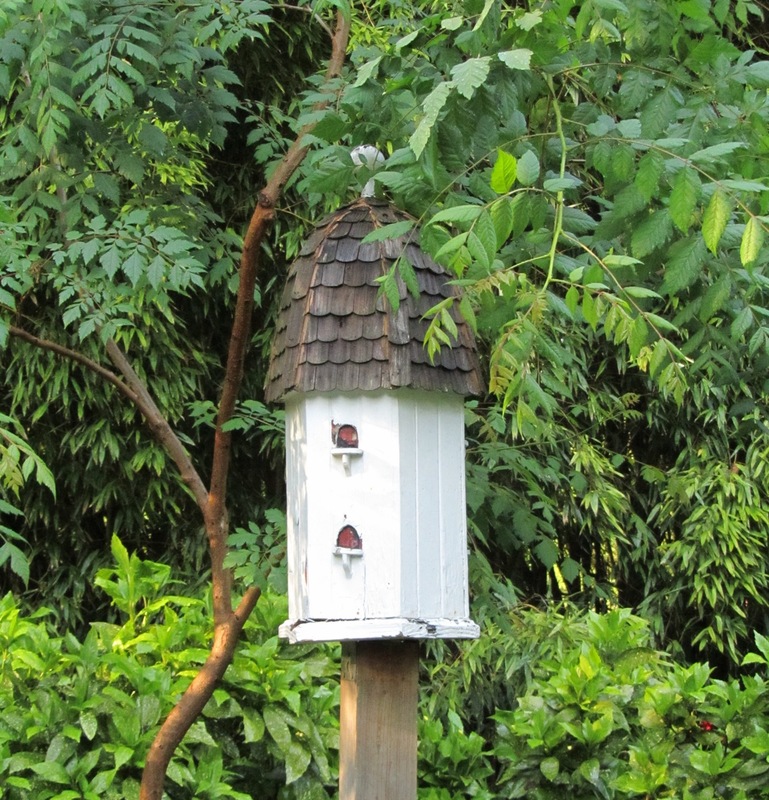 A hand crafted martin house beneath a golden rain tree is a reminder of the birding paradise the couple has created. Exiting through the garden gate, we are not disappointed by what we encounter. A colonial garden house, designed and built by the owner, greets us in this space. I’ll say no more. A photograph of this structure is worth a thousand words. 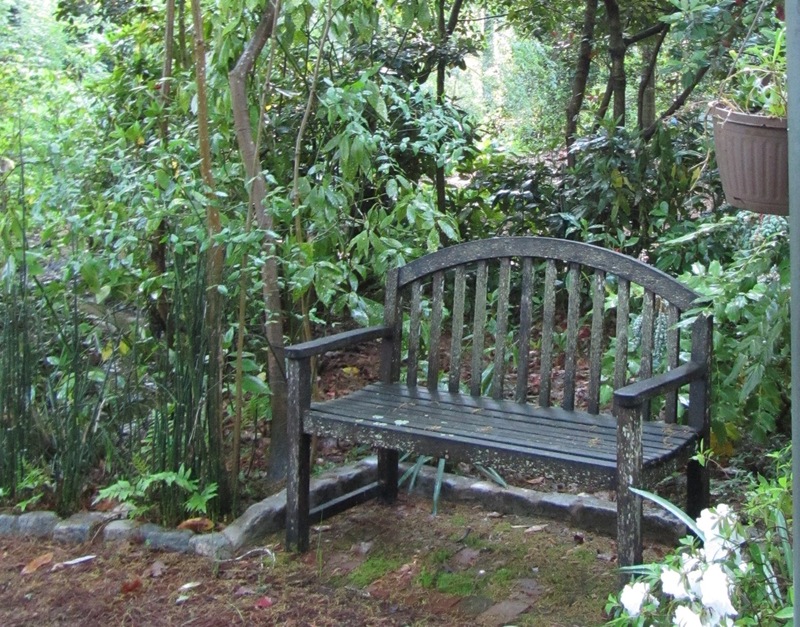 The newest feature in the landscape, the Charleston Garden, bids a welcome to enter and rest on one of the benches. High stucco walls, beautifully designed brick walks, statuary, a pool with splashing water and colorful fish, and cool green groundcover, invite you to linger. 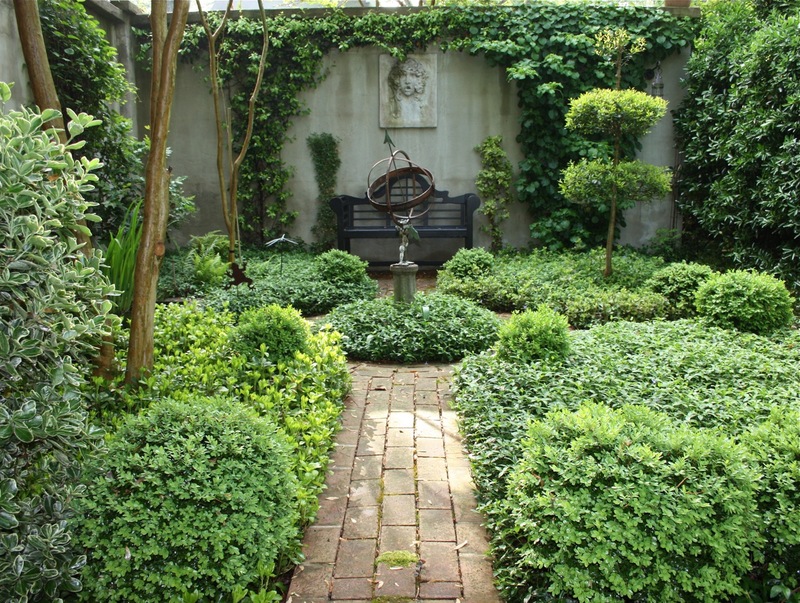 With a daughter living in Charleston, the couple made numerous visits, falling in love with the courtyard garden designs. I’m sure readers will agree that the owners have created an Eden…. but I might be a bit biased. On an earlier blog entry, I whisked you away to California to visit my sister’s whimsical garden in San Diego. This time you left your stresses at the gate and toured the garden retreat of my brother and his wife who live in Richmond. For another view of his garden house, click HERE. 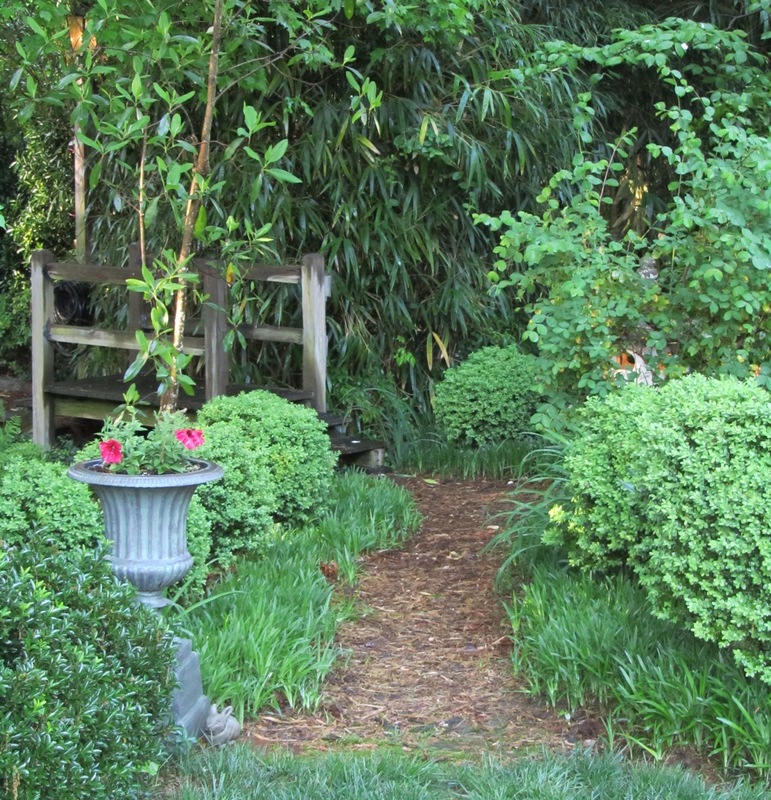 This entry was posted in garden design, garden paths, garden sheds, gardening, gardens, Horticulture, Virginia and tagged Garden, Home garden, Richmond, Shed, Virginia by Annie. Bookmark the permalink. It is a magical yard! My favorite time to visit is the cocktail hour to stroll through the illuminated paths, wine in hand…. Great photos…it’s a very nice garden. I’d love to have a shed like that. Did I mention it has lovely steps up to a spacious upstairs? A bed and a table would be all I’d need! Do you by chance know the measurements of the shed? “Well, it’s small….by design. In my county one doesn’t need a permit to build an 8×12 or less……so, that’s what it is. It has a full 8′ ceiling and a stand-up attic with a pull-down stairway. The roof is a 12/12 pitch. I built the whole thing with no plans, except for a photo of a shed across from historic Bruton Parish Church in Williamsburg VA. A good thing is that all building materials are sold in 4×8 sizes, like plywood for the sheathing, attic floor, underflooring and roof, and the lumber all comes in 8 and 12 ft lengths. Lovely garden – so green and beautiful. I love the shed. I’m afraid if I started building them, I’d never be able to stop! Thanks for a beautiful post! I checked out your new blog and think it is excellent. I will definitely be a follower! Thank you very much! I appreciate the encouragement as I am new at this. Best regards! Wow! beautiful garden, a nice place to go. These lovely surroundings reflect the people who created them. It could be featured in a magazine…BEAUTIFUL!!! 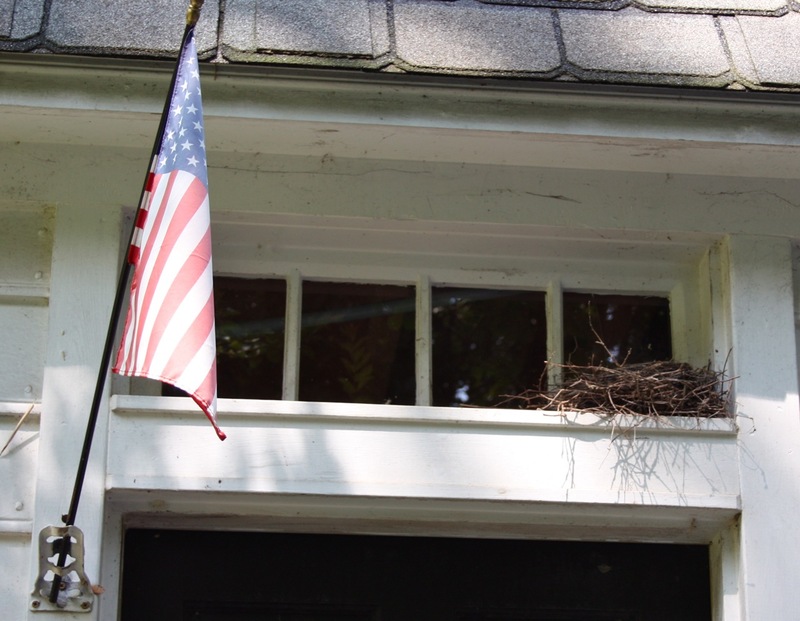 Thank you for the beautiful article and photography on my parent’s house, Ann! It is quite special, isn’t it? Hard to believe how much it has transformed over the years…and they continue add special touches every time I turn around. What’s so great is that it wasn’t planned, built or planted by others…. They have worked hard to come up with the perfect layout, laying the brick paths themselves, building the garden house, the pond, etc. Such talent! It runs in the family. Just another wonderful quality that skipped over me…ha ha! Some families have it all…. The Gardening Abbitts! Bloom, I think it could make the cover of a magazine! Gardening, We certainly don’t have it all but we all love to dig in the dirt. I have loved seeing Billy and Lizzie’s gardens. I love the cat in the garden with the smile–a portrait of Baby Pookie. All of you are so talented. It could be Baby Pookie but the claws aren’t long enough. That cat could scratch! Oh, so beautiful! I wish it wasn’t November – I’d be out there making miracles of my own. Inspiring! I am building a garden shed this spring just like yours. Do you have a plan you used that I could purchase? Or do you know how/where I could get it? 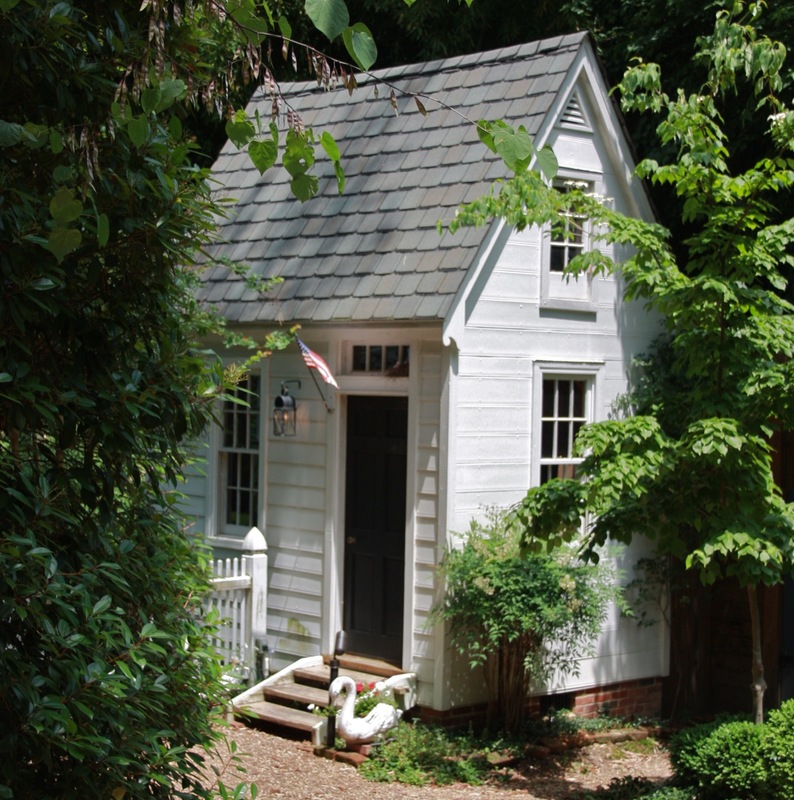 Allie, my brother built this garden shed with his own measurements but he never drew up plans. Perhaps if you showed the picture to a contractor or builder they could duplicate it. I wish you the best of luck finding the shed you love.